Adobe has decided to add some interesting, new features available for Adobe XD. As we know, prototyping is a foundation of the Adobe XD. However, they have made prototyping so good that now we have voice triggers and speech playback. These features make XD truly special when it comes to other UX/UI platforms, as this app connects screen and voice prototyping in one app smoothly. Besides this, there is new animation support and third-party plug-ins. Third-party plug-ins will allow developers to come up with exciting, new ideas and implement them to integrate and extend the platform in various ways. They are allowed to customize and extend XD which can perfectly meet their needs. Voice Prototyping – How it Works? One of the major trends is definitely the implementation of voice experiences anywhere possible, from phones to cars. Therefore, it is no wonder why Adobe XD has created simple voice prototyping for its users. It has never been easier to interact. The interaction starts from the moment you say specific word or phrase. Afterward, speech playback provides you with access to the text-to-speech engine. Basically, that means you can design for new platforms like voice assistants and smart speakers. Maybe the best thing about this plug-in thing is the fact that Adobe XD has created its plug-ins in cooperation with the developer community. Therefore, we can expect useful capabilities. One of the first plug-in waves gives us the possibility to automate tasks, integrate with other tools, leverage data in your designs, and much more. It only gets better, as they have made integration with some of the major collaboration and productivity apps like Slack, JIRA, and Microsoft Teams. However, this is not ending here. 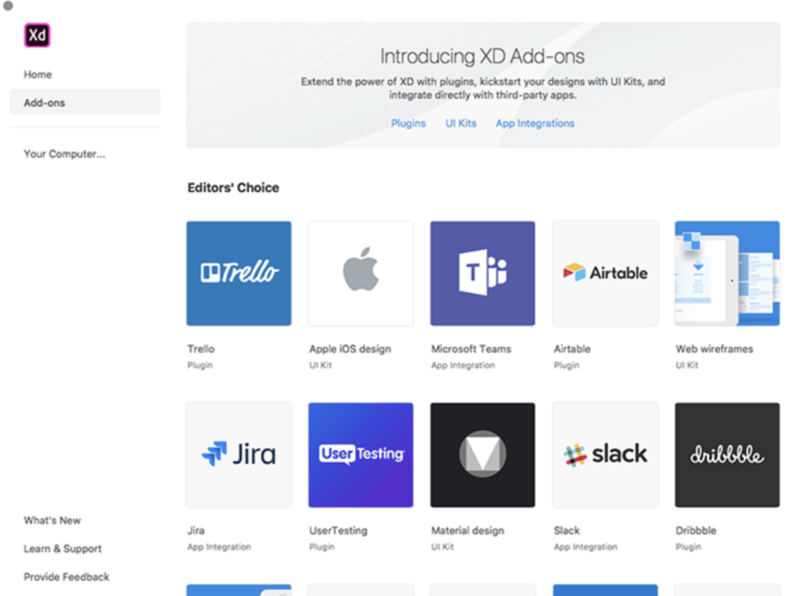 The idea is to extend Adobe XD platform and make it open to the developers around the globe so the library of the plug-ins and integrations can expand. All of those who are interested in developing plug-ins for Adobe XD can learn more about APIs on their website. It should be mentioned that XD can be easily integrated with the Adobe Illustrator which gives us the possibility to open .ai documents, preserve all layers, artboards, and symbols with the ability to edit Illustrator artwork directly in XD. There is no longer fear that you won´t be able to edit your Illustrator design when you paste it to the XD as now these two programs operate together.